Democrats are hopeful that Republicans’ vote last week to pass the American Health Care Act provides them an argument to use in next year’s election. Only 20 House Republicans voted against the bill, which is not polling well and which Democrats are angling to use as a cudgel against the GOP. The AHCA’s passage in the House serves as a news peg for us to move a number of Republican-held House districts into more competitive rating categories. That doesn’t mean the AHCA will be an anchor on GOP incumbents next year. It’s just too early to know, for reasons we’ll get into. But broader historical patterns suggest that the Democrats have a chance to win the House next year, and health care could be part of a potential winning message. This weeks’ changes align our ratings with our overall belief that the House is in play, even while noting that the true level of danger Republicans face is as yet unclear. The final story of the AHCA has yet to be written. Presumably, the Senate’s version will differ from the House’s, which means that the two sides will have to sort out policy differences. Whatever emerges may be a little different, or a lot different, from what the House passed (and that assumes the Senate can pass a version of the AHCA, which it may or may not). Of course, Democrats will attack House Republicans over this version of the AHCA regardless. Turnabout, here, is fair play: Republicans savaged red-district Democrats over a cap-and-trade climate change bill that passed the House in 2009 but did not even get a vote in the Democratic-controlled Senate. On that bill, many vulnerable House Democrats walked the plank for nothing. It remains to be seen whether vulnerable House Republicans did something similarly futile on health care, but in any event it seems unlikely that this specific version of the bill is going to become law (although a version that is very similar might). And there are unknowns besides the vagaries of the eventual health care changes that become law (or do not). Is health care actually going to be the animating issue for voters next year? We’ve got roughly a year and a half to go before the midterm, which means that lots of other issues (and events) could intrude upon health care’s current prominence in the national conversation. New developments could be good — or bad — for the ruling Republicans. For instance, we’re focusing in this article on the health care vote, but already — in this unusual, hyper-controversial White House — something else has already grabbed the headlines. Naturally, President Trump’s stunning firing of FBI director James Comey could have electoral effects, too, because the investigation of the Trump team’s ties to Russia will stretch to 2018. In time, we’ll assess this event in terms of next year’s midterms, but for now, we’ll stick to health care since we’ve had sufficient time to see the reshaped landscape. All we can say right now is that Democrats paid a political price for drawn-out attempts to alter the American health care system in both the 1994 midterm, when their health care efforts failed, and in 2010, when their efforts resulted in the Affordable Care Act (“Obamacare”). It’s not crazy to suggest Republicans will also discover that taking ownership of health care could be bad for them, too, but it’s also not a certainty. Still, the case for GOP health care troubles rests upon a broader theory about the American public, which is that the public is resistant to dramatic change and is inherently skeptical of the party in power, particularly if it views that party as overreaching. That often pushes them to consider the minority party in the next midterm election, and the party that does not control the White House almost always gains House seats in midterm elections. Additionally, the public often gravitates to the ideology and policy preferences of the party not in power. 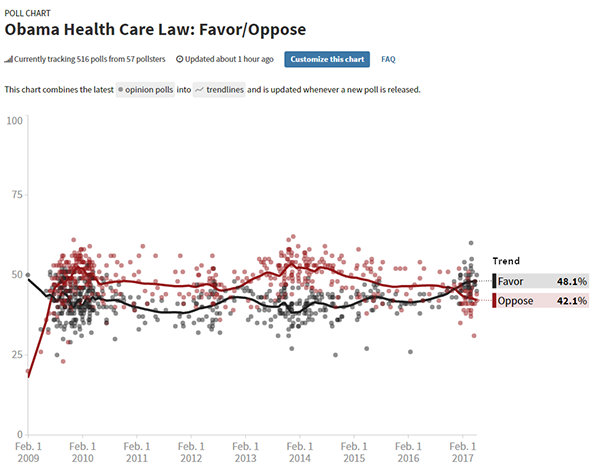 We can see this with changes in public opinion over the Affordable Care Act, which was unpopular for essentially all of Barack Obama’s presidency (see Chart 1). Only now, with Trump in office, is the ACA’s favorability positive, which is unsurprising given the natural rhythms of public opinion. In his book Tides of Consent, James Stimson notes how the popularity of liberalism waxes and wanes depending on which party controls the White House. “Preferences ‘zig’ upward (toward liberalism) when Republicans control the White House and ‘zag’ downward when Democrats are in charge,” Stimson writes. This routine change in preferences, which in the post-World War II era has consistently broken against the president’s party, probably helps explain the consistently poor performance of the president’s party in midterms. Indeed, Pew recently found that the public now favors a bigger government that provides more services over a smaller government that provides fewer services after preferring the opposite during the Obama years. This reactionary voter behavior against the ideology of the party in power, combined with poor presidential approval and other factors, can lead to midterm waves — indeed, that’s what happened in the last three midterms (2006, 2010, and 2014). Will it for a fourth time in a row? Maybe. Beyond the health care vote, Donald Trump’s approval rating remains persistently weak: His approval is in the low 40s in averages and his disapproval remains over 50%. As we noted earlier this year, those are the kinds of numbers that can lead to bad midterms for the president’s party. Additionally, Democrats have consistently led so far on the generic House ballot, national polls that ask how voters intend to vote in their local House race. FiveThirtyEight’s Harry Enten found that it’s unusual for the party out of power to hold a clear generic ballot lead so early in a cycle. As of now, polling averages show Democrats with a lead of about six points on the generic ballot. They probably will need to have a bigger lead in those polls to flip the House — Democrats were up 11.5 points in the generic ballot when they netted 30 seats and won the House in 2006 — but they are off to a decent start. Obviously, a lot can and will change between now and the fall 2018 campaign, and polls right now are far from predictive. But Democrats looking for some positive indicators for next year have some data points, and some history, to point to. When assessing a recent statement by the chairman of the Democratic Congressional Campaign Committee, we should perhaps judge it by a phrase typically applied to the new Republican president. Rep. Ben Ray Luján (D, NM-3), who is now in his second cycle of chairing the Democrats’ House campaign arm, recently told the New York Times that “no district is off the table” in his party’s quest to win back the House majority after what will be, by the time the next Congress is seated in January 2019, eight straight years of GOP control. In actuality, there are many, many districts that are effectively “off the table” for both parties. Using the 2016 presidential results as a guide, the most Democratic district held by any Republican is that of retiring moderate Rep. Ileana Ros-Lehtinen (R, FL-27). Hillary Clinton carried her South Florida district by 20 points. Meanwhile, the most Republican district held by any Democrat is that of long-time moderate incumbent Rep. Collin Peterson (D, MN-7), who just announced that he intends to seek another term. Trump carried Peterson’s western Minnesota seat by a punishing 31 points, a margin that is roughly double the margin Trump carried the next-most Republican districts held by Democrats (Trump carried the districts of Peterson’s fellow Minnesotans, Rep. Rick Nolan and retiring Rep. Tim Walz, by 16 and 15 points, respectively). For the sake of argument, let’s set Peterson’s district aside as an outlier and define the districts of Nolan and Walz as roughly the Trumpiest districts open to Democrats. Additionally, let’s define Ros-Lehtinen’s district as the upper limit of what is achievable for Republicans in Clintonian districts. That leaves 141 Republican-held districts as too Republican for Democrats to compete in, and 135 Democratic-held seats as too Democratic for Republicans to compete in. In other words, close to two-thirds of all 435 districts (276, or 63% of the total) are not really gettable by either side. So when Luján says that “no district is off the table,” perhaps we should take him “seriously, but not literally,” to borrow the phrase sometimes used to describe the charitable way some view President Trump’s more outlandish statements. It is within the remaining 159 districts, which make up about 37% of the House’s total, where majorities are won and lost. Of these districts — which includes Peterson’s even though his district is technically outside of the range specified above — Republicans control 100, and Democrats control 59. Putting as many of those 100 “on the table” is Luján’s goal. Democrats need to win about a quarter of those seats, 24, to win the House, while not losing any of their own seats in the process. This week, we’re moving 18 Republican-held districts to more competitive categories. Table 1 shows the ratings changes, and Table 2 shows our updated ratings of competitive Republican and Democratic seats. Of the 18 GOP districts where we’re making changes, all but two of those seats feature incumbents who voted for the AHCA. It is possible that they will pay some sort of electoral penalty for voting for the bill, much like Democrats who voted for the ACA in 2010 may have been damaged by that vote: political scientists Brendan Nyhan, John Sides, Eric McGhee, Seth Masket, and Steven Greene argued in a 2012 article that “the vote share of Democrats who supported health care reform was 5.8 points lower than that of the most comparable Democrats who opposed the bill.” Then again, the Republican wave that year washed over ACA supporters and opponents alike: Of the 34 House Democrats who voted against the ACA, half lost in 2010, and only three remain in the House (similarly, just three of the 44 House Democrats who voted against cap and trade remain in the House). The two members who are being downgraded this week despite voting no on the AHCA are Reps. Barbara Comstock (R, VA-10) and Mike Coffman (R, CO-6). Both are talented incumbents who won competitive races in a clear way last year — Comstock by six points, Coffman by eight — but Hillary Clinton won both of their districts in 2016 and improved on Barack Obama’s 2012 showing, and now credible Democratic challengers are emerging in both districts. A bad environment for Republicans next year — which is possible but not guaranteed — could hurt both incumbents regardless of their voting record. Both districts move to Toss-up. Joining Comstock and Coffman in the Toss-up category are several other House Republicans who, unlike Comstock and Coffman, voted for the AHCA. They are Reps. Jeff Denham (R, CA-10), Steve Knight (R, CA-25), Carlos Curbelo (R, FL-26), and Don Bacon (R, NE-2). Clinton narrowly lost Bacon’s district but won the other three, including Curbelo’s by a 16-point margin. Nonetheless, Curbelo won by double digits against a damaged former representative last year (Joe Garcia), while the other three won by smaller margins. If the AHCA is a liability for Republicans next year these are some of the members who could find themselves in a perilous position, and even if health care is not the defining issue next year they still should be major Democratic targets. The remainder of the rating changes fall into two broad categories based on last year’s presidential results: Districts where Clinton outran Obama, and districts where Trump outran Mitt Romney. In the first group, Rep. Martha McSally (R, AZ-2) lost and then won two of the closest races in the country in, respectively, 2012 and 2014. She coasted to reelection last year against a weak opponent even while her district flipped from Romney to Clinton. Her district is competitive enough that she’ll have a hard time ever being completely secure, and if the health care bill does become a big issue next year, Democrats will assuredly be referring back to an anecdote about her role in its passage (profanity warning at the link). Rep. Erik Paulsen (R, MN-3), another Republican who significantly outperformed Trump even as his district broke for Clinton last year, has already drawn a credible challenger, and Rep. Dana Rohrabacher (R, CA-48) may be rusty — he mostly has enjoyed very easy elections even as his district has become less conservative — and his boosterism of Russia may be a liability depending on what comes out in the wake of the Comey firing. All three districts move from Likely Republican to Leans Republican. Two other members to watch are Reps. Mario Diaz-Balart (R, FL-25) and Randy Hultgren (R, IL-14), who probably are only vulnerable in a wave environment but whose districts also became a little less Republican last year. Both move from Safe Republican to Likely Republican. Then there’s the other group of districts, where Trump overperformed and Clinton underperformed last year. Chances are, if Democrats want to win the House, they need some of these districts to snap back to them, even though many are filled with the white working-class voters who have been trending away from Democrats in recent years. Those targets include Reps. Rod Blum (R, IA-1), David Young (R, IA-3), Bruce Poliquin (R, ME-2), John Faso (R, NY-19), Lee Zeldin (R, NY-1), and Mike Bishop (R, MI-8). The first four move from Likely Republican to Leans Republican, and the latter two move from Safe Republican to Likely Republican. Also appearing on the competitive list as Likely Republican is the swingy seat held by Rep. Tom MacArthur (R, NJ-3). Trump flipped the district from Obama but MacArthur’s crucial role in the passage of the AHCA in the House could hurt him. But that’s only if health care is a larger problem for Republicans next year. As noted above, it could be, but that’s far from certain. 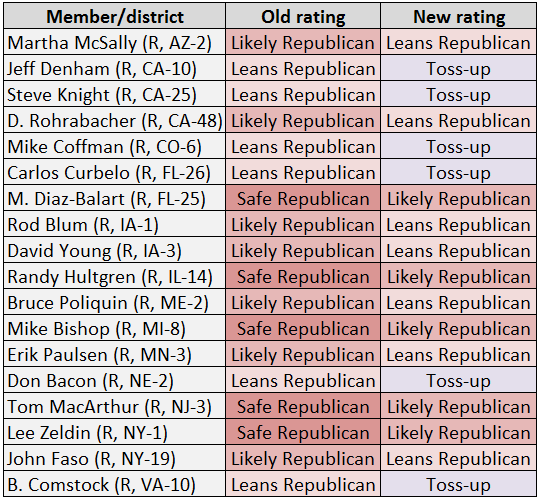 With this week’s ratings changes, there are now 20 Republican-held House seats in our competitive Toss-up or Leans categories. One of them, Ros-Lehtinen’s open FL-27, is already rated Leans Democratic because it now lacks an incumbent and is the most Democratic-leaning seat held by any Republican. There will be many more retirements, and if they come in marginal seats those openings could be crucial in the Democratic effort because winning open seats is easier than beating incumbents. Still, even if Democrats hold all their seats and win all of the Republican Toss-ups and Leaners, they’d still be a few seats short of a majority. So they need to further expand the playing field. We think the combination of a controversial and unpopular health care bill, a president with approval ratings that are poor, and the general tendency for the president’s party to struggle in the midterm is a recipe for potential Democratic success. The history is what it is, but perceptions of Trump and the health care bill are not set in stone. New events will change the calculus, both to the benefit and detriment of the ruling party. The Comey dismissal is just the latest example, and its effects are as yet unclear. We’re not predicting anything yet, and there’s a long way to go.